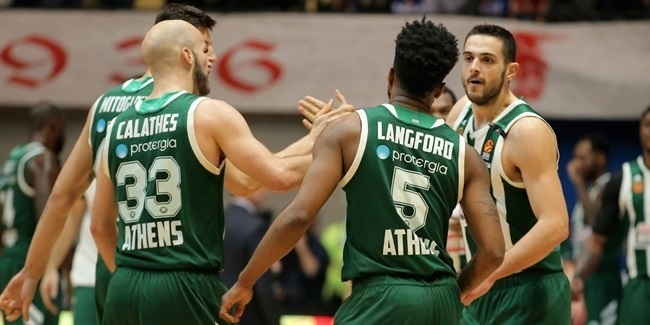 "We played the best half of basketball offensively and defensively of the season, it was absolutely magnificent," is how Panathinaikos OPAP Athens head coach Rick Pitino opened his press conference after a victory over visiting KIROLBET Baskonia Vitoria-Gasteiz on Wednesday night. If you had just heard that opening sentence, one would never know Pitino was left disappointed at the end of the night, as were his players despite 72-70 victory. They played a near-perfect first half, yet squandered away a 23-point third-quarter lead before managing to pull out victory in a dramatic finish. "We broke down at both ends, offensively and defensively," Pitino said, summing up his team's second half, during which Baskonia made a 2-28 run to turn 56-33 deficit into 58-61 lead with 6 minutes to go. It's is rare to see a game with so much at stake feature such different halves as this one did. Both teams are fighting for the playoff spots, but each displayed their respective Dr. Jekyll and Mr. Hyde faces. Panathinaikos dominated early behind a defense that kept Baskonia without a field goal for 8 minutes to start the game, and led to the Greens building 21-2 lead. Baskonia head coach Velimir Perasovic said his team looked scared. As the guys in the green uniforms kept flying around, Baskonia could not get any closer than 13 points, and was down by 23 midway through the third quarter. Then, it was like someone flipped a switch for the next 9 minutes. Baskonia scored the last 15 points of the third quarter, and opened the fourth with a 2-13 run to take the lead. Suddenly, playing with point guards Luca Vildoza and Marcelinho Huertas together on the floor, Baskonia found all the answers of how to solve the Panathinaikos defense, scoring on 11 of 12 possessions bridging third and fourth quarters. 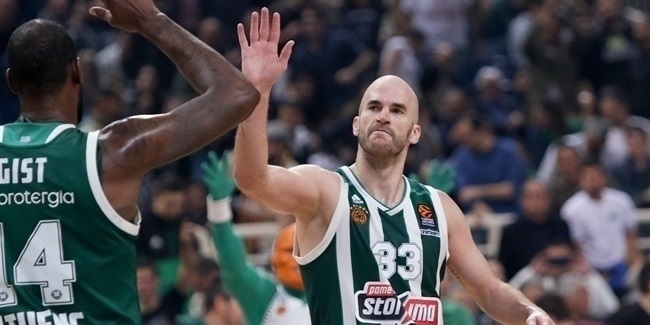 The game went down to the wire, where a three-pointer and a defensive play by Sean Kilpatrick, and a jumper by DeShaun Thomas, prevented one of the biggest comebacks in EuroLeague history. "We go to Milano understanding it's another big game, but the great thing is knowing that if we get to ever play that type of half for just 33 or 35 minutes of the game, we can beat just about anybody."